What was supposed to be 174 calories is actually 123 because of my snail's pace. Found a new route that has almost no traffic so I can go a little faster. Anyway, I first photographed a couple of guys at my favorite breakfast taco place... but it wasn't very decisive. 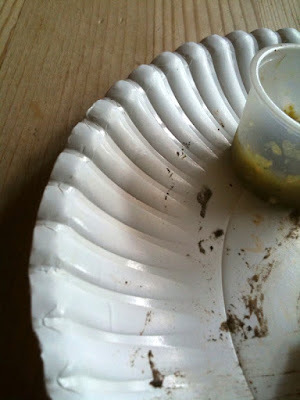 Then as I was putting my iphone down I saw my empty plate as an Edward Weston (for you photo people) seashell.